Charles White will speak to AAUW about "The Long Road to Tehachapi." American Association of University Women invites the public to attend its April 10 meeting when Charles White will speak about “The Long Road to Tehachapi.” He will recount the history of the area and lessons learned from the past. The meeting will be held from 4 to 5:15 p.m. at Community Church Friendship Hall, 100 E. E St.
Charles White moved to Tehachapi about 19 years ago and has immersed himself in learning about and serving the community. He is president of Tehachapi Heritage League, for which he is well qualified. His career was spent as an art and museum consultant in the United States, Canada and China. White currently serves on the city's Planning Commission. He is also on the Main Street board, which promotes historic preservation and economic development to restore prosperity downtown. He is a member of the murals committee and played a large role in selecting artists and locations for the many murals around town. AAUW is a national organization which promotes equity and education for women. 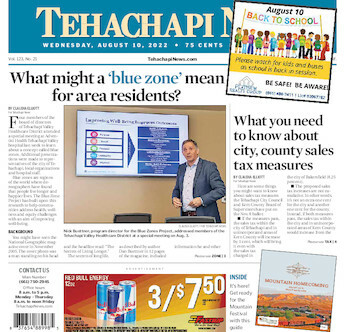 Tehachapi Mountain Branch of AAUW has a strong local connection. They give scholarships to graduating high school seniors as well as grants to women who complete their education years later. They send junior high girls to Tech Trek, a math/science camp. They find other ways to support the schools and organizations in Tehachapi. Phyllis Belcher is a long time Tehachapi resident, and is involved in various volunteer organizations.